When I think of trips, I think of going overseas. Like a Caribbean cruise I took with my mother. I didn’t have a camera at the time. We took special trips like visiting caves (where it was actually warm inside because of thermal springs below), snorkeling, and went to a rum factory. The cruise was perfect for the setting of a teen vampire cruise story. Then we went to the Grand Cayman Island and rode on a pirate ship cruise (I walked the plank and jumped into the water), sunset cruise, submarine dive, walked the white-sand beaches, and swam in the aqua blue waters. We snorkeled and fed the stingrays. I set Howl for a Highlander there, perfect fish-out-of-water scenario. He taught the pirates on the ship a thing or two about how to really use a sword and got to do everything we did. I’ve been to Scotland twice, and I’ve used the settings there for the Highland wolf stories: Heart of the Highland Wolf, Highland Werewolf Wedding, Hero of a Highland Wolf. I do have tons of pictures of Scotland. One of the first castle ruins I saw was used in Highland Werewolf Wedding. I felt warm there, when it was freezing out on the North Sea, and the walls were mostly missing. But I felt good there, like I belonged, welcome, and I wrote that the heroine did too, learning that it was her ancestral home. And I’ve been to Greece and Turkey, and the Greek islands on a short cruise. I loved their little windmills! Reminded me of Holland, but different. I loved Greek mythology, so it was fun seeing the beautiful architecture there, the temples to the gods and goddesses. And their beautiful churches. I wish I’d had a camera back then! I’ve been to the US Virgin Islands also. Saw barracuda in the water with us. I swam in a fish with sharks once too in Florida! And I’ve been to Hawaii, climbing around the waterfalls, and swimming in the ocean. Just beautiful. But trips to other places Stateside are just as much fun. I’ve visited two wolf reserves in New Mexico and Texas, and two in Minnesota. And I visit zoos all over to see jaguars and other wolves. In Fort Worth, they had a beautiful red wolf. They had them at one of the Minnesota wolf reserves too. They’re so rare, it’s special to see them. The one wolf reserve is in Ely, Minnesota, where the Boundary Waters are located and I set Flight of the White Wolf up there. Plus, I signed books all over New Mexico, Texas, and Minnesota! I also try to see sites whenever I go to conferences to add to the experience, like visiting Wisconsin (I lived there when I was a little and remembered the fall leaves and snow well), but signing books all over and seeing one of the zoos there, where they had gray wolves, or San Diego and seeing the zoo there, the ocean, seals on one of the beaches, and signing books all over, is also a highlight of my trips! We even drove to Arizona! Saw the sand dunes and signed books at a book store. Daytona Beach and St. Augustine too! Now when I go anywhere, I always have my camera and take tons of pictures—from a butterfly to castle ruins to wolves! I never know when someplace I’ve been just has to be the setting for a new story. The setting, the atmosphere, like when I lived in Florida, is just perfect for the story, a character sometimes in itself. Happy travels! You never know where you might find wolves and jaguars—just anywhere! 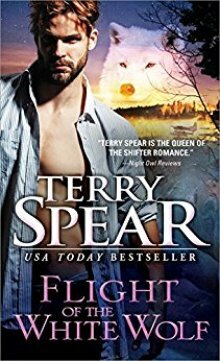 Gavin Summerfield—an arctic wolf shifter with a fear of flying—has to fly into the vast lakeland wilderness of northern Minnesota to track down his suspect—where his ability to shift will come in very handy. Imagine his chagrin when his pilot turns out to be the woman who tasered him last time they saw each other. Things are off to a rocky start...again.